TLA Network - Spread the Word! Thank you for helping us spread the word in your communities about the Power of Words Conference! Below you will find summaries, links, flyers, and templates to share on your social media profiles, local event calendars, and favorite libraries, bookstores, theaters, and coffee houses. Here is an email template to use to invite your friends, coworkers, students, etc. to the conference. There are highlighted sections for suggested personalization, but of course, feel free to change anything to make it your own. Thank you! I'll be there, [How are you participating in the conference? Attending, presenting, volunteering...?]. The conference features workshops, performances, talking circles, celebration and more, featuring writers, storytellers, performers, musicians, community leaders, activists, educators, and health professionals. Check out the schedule of events here. 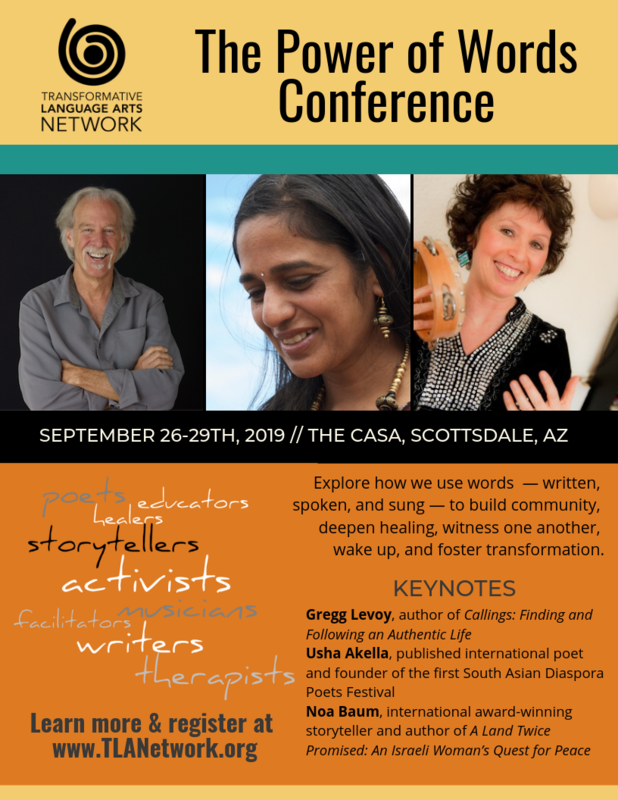 The conference keynoters sound incredible, including author and speaker, Gregg Levoy; storyteller and author, Noa Baum; and and poet and playwright, Usha Akella. Will you please share this with [Who are they connected to? ], and consider joining us yourself? P.S. I've attached the conference flyer [See below to download flyer]. Will you print out a copy and post it [Where do they have access?]. Thank you! Know some rad places to display a flyer?